100 % pure, of a non organic origin and free of any profuse ingredients. 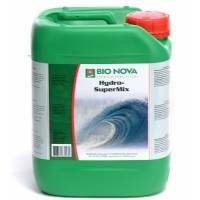 Hydro-SuperMix is a one component bio-mineral fertilizer especially developed for systems with artificial substrates such as rock wool, etc. Nutrients for growing and flowering, and A/B are combined within one product, which makes cultivating very easy. All of the elements mentioned above are 100 % pure, of a non organic origin and free of any profuse ingredients. Therefore, this fertilizer is absorbed directly, and a low EC will suffice. Hydro SuperMixenhances an optimal soil condition, actively stimulates root development and provides as a complete fertilizer not only for growing but also for flowering. Apply a supplement of PK 13-14 as Superbloomer during the flowering period. Continuously mix in 280-350 ml. per 100 litres of water. Build up from 140 ml. to 280 ml. during that period. From the second week, the maximum dosage should be applied.